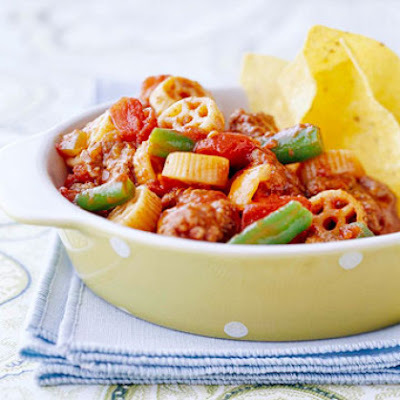 This family favorite ground beef and pasta dinner recipe has wagon wheel macaroni and green beans in a spicy tomato sauce. With its short preparation and cooking time, you will be adding this one to your weeknight meal rotation. Plus, its a great way to get your kids to eat more green vegetables. 1. In a very large skillet, cook ground beef and onion over medium until meat is brown. Drain off fat. Stir undrained tomatoes, tomato juice, chili powder, and garlic salt into meat mixture. Bring to boiling. Stir in pasta and green beans. Return to boiling; reduce heat. Cover and simmer about 15 minutes or until pasta and beans are tender. 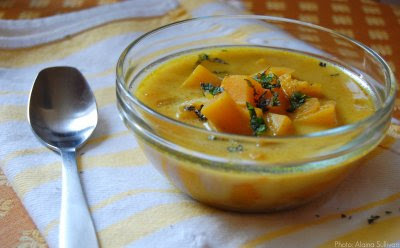 Squash soups typically rely on a blender to give them a luxuriously creamy consistency, yet this version achieves richness without being pureed to a pulp. Small cubes of butternut squash are cooked in a milky-sweet broth, and they hold their shape all through cooking. The soup becomes creamy by way of coconut milk, which contributes a rich flavor without weighing it down. Curry, cinnamon and cumin spike the broth just enough to accent the squash without masking its natural flavor. The curry and coconut shine together as they usually do, but it’s the cinnamon that brings a warm, unexpected undertone to the dish. It’s a soup that sits in limbo somewhere between creamy and brothy, sort of the best of both worlds. Garnish with fresh cilantro or mint. Recipe from Mark Bittman’s Kitchen Express. The juicy, flavorful rib chop is the main attraction in this Tuscan-style main dish but its flavor is heightened when served with the creamy Gorgonzola cheese sauce. 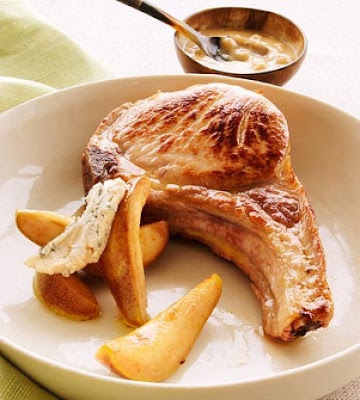 The fruit flavor of the lightly browned pears mingles well with the meaty taste of the chops. For other ways to prepare pork chops, see more recipes that are available. 1. Sprinkle pork chops with salt. In a 12-inch skillet cook pork chops in hot oil over medium heat for 5 minutes. Turn chops and cook 5 minutes more or until browned and juices run clear (160 degrees F). Transfer chops to a serving platter. Drain fat from skillet. 2. In same skillet cook pear wedges in butter over medium-high heat for 5 minutes or until browned, turning once. Add pears to platter. 3. 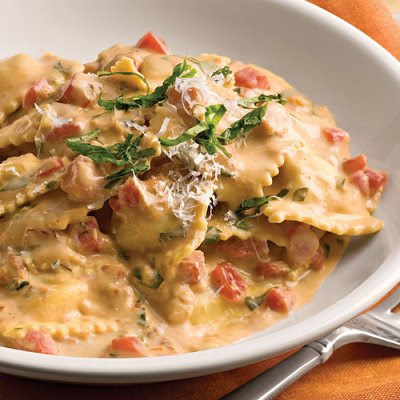 For sauce, add wine and cream to skillet. Bring to boiling; reduce heat. Boil gently, uncovered, 1 to 2 minutes until slightly thickened. Add the 8 ounces Gorgonzola; whisk until cheese is almost melted. Remove from heat. Serve with pork and pears. Sprinkle with pepper; serve with additional cheese. Makes 4 servings. 4. Test Kitchen Tip: Rib chops are notable for flavor and juiciness. This Italian staple has all the comfort you’d want from a baked pasta dish, but with the bonus of veggies: Broccoli and spinach are folded into a creamy filling made with Parmesan, mozzarella and ricotta. 1. Heat oven to 400°F. Cook the pasta according to package directions. Drain and rinse under cold water to cool. 2. Spread the sauce onto the bottom of a large broiler-proof baking dish. 3. Squeeze the spinach of excess moisture, roughly chop and place in a large bowl. Chop the broccoli and add it to the bowl. Stir in the ricotta, Parmesan, 1/2 cup of the mozzarella, and 1/2 tsp each salt and pepper. Spoon the mixture into the shells (about 1/4 cup each) and place on top of the sauce. 4. 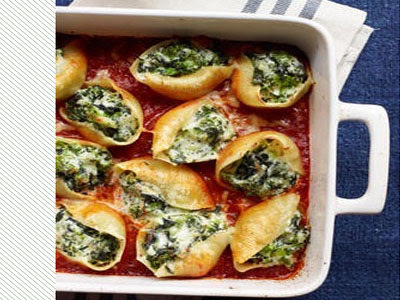 Sprinkle with the remaining 1/2 cup mozzarella and bake until the shells are heated through, 10 to 12 minutes. Increase heat to broil. Broil the shells until the cheese begins to brown, 2 to 3 minutes. 5. Meanwhile, in a large bowl, whisk together the oil, vinegar, and 1/4 tsp each salt and pepper. Toss with the lettuce, cucumber and onion. Serve with the shells. This delicious casserole has all the spicy, savory flavors of Mexican tamales, with considerably less fat and less preparation time. 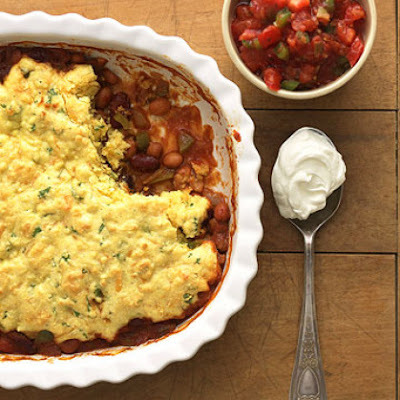 A hearty mixture of beans, vegetables, and seasonings is baked beneath a cornbread crust for a delicious vegetarian meal; it's perfect for a cold winter night. Using a packaged cornbread mix, jazzed up with cheese and cilantro, keeps things simple while adding terrific texture and flavor. 1. Grease a 2-quart square baking dish or 10-inch quiche dish; set aside. 2. In a medium skillet cook sweet pepper, onion, and garlic in hot oil until tender. Stir in kidney beans, pinto beans, vegetable juice, chile peppers, chili powder, and cumin; heat through. Spoon bean mixture into the prepared dish. 3. Prepare corn muffin mix according to package directions. Add cheese and cilantro to muffin mix, stirring just until combined. Spoon cornbread mixture evenly over top of bean mixture. Bake, uncovered, in a 400 degree F oven about 25 minutes or until golden. If desired, serve with salsa and sour cream. Per serving: 185 calories; 9 g fat (3 g saturated fat, 2 g mono unsaturated fat); 61 mg cholesterol; 2 g carbohydrates; 24 g protein; 0 g fiber; 349 mg sodium; 466 mg potassium Nutrition Bonus: Excellent source of omega-3s. 1. Toast pepitas (see Tip). Place in a small bowl with butter, lime zest, lime juice and chili powder. 2. Generously coat a large nonstick skillet with cooking spray and place over medium heat. Sprinkle salmon with salt and pepper, add to the pan and cook until browned and just cooked through in the center, 2 to 4 minutes per side. Remove the pan from the heat. Transfer the salmon to a plate. Add the butter-lime mixture to the hot pan; stir until the butter is melted. Serve the salmon topped with the sauce. 3. Tips: Pepitas (hulled pumpkin seeds) can be found in the bulk-foods section of natural-foods stores or Mexican groceries. Place a salmon fillet on a clean cutting board, skin side down. Starting at the tail end, slip the blade of a long, sharp knife between the fish flesh and the skin, holding the skin down firmly with your other hand. Gently push the blade along at a 30Â° angle, separating the fillet from the skin without cutting through either. Place pepitas in a small dry skillet and cook over medium-low heat, stirring constantly, until fragrant and lightly browned, 2 to 4 minutes.